As a KEF owner, I delight at each and every opportunity to test another one of their product lines. Thanks to my work here, I've demo'd everything from the powerful Q Series to a variety of in-ceiling and Dolby Atmos add-on modules. I've also had the extraordinary privilege of hearing demonstrations in professional mixing stages within the Los Angeles area as well as Dolby's working laboratories. With these sonic benchmarks in mind, I humbly say KEF R Series speakers are the most true and well-rounded I've heard outside of a professional environment. And to be honest, they sound a lot better to my ears than the majority of commercial cinema auditoriums. They're expensive. There's no getting around it. But if the KEF R Series, in any configuration, is within your budget, stop what you're doing right now and go demo these immediately. 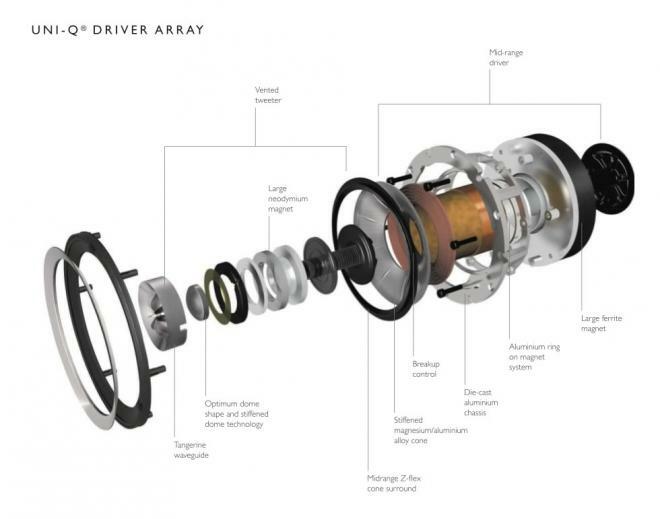 KEF is a British speaker company known for its revolutionary two-way Uni-Q driver array which places the tweeter directly in the middle of the mid and/or low frequency driver (depending on the speaker model). This proprietary technology keeps the mids and highs in time and phase, improving off-axis tonal performance and stereo imaging in two-channel and surround configurations. In the best sense, the Uni-Q array makes KEF speakers simultaneously invisible and pin-point precise. There have been many versions of the Uni-Q over the years, but the KEF R Series steals much of its Uni-Q array design from the flagship Blade series, which retail for a heart-stopping $32,000/pair. Yeah, you read that right. Step right up and buy two Blade towers OR a base model Ford Mustang GT. Ultimately, trickle down technology means the R Series offers staggering fidelity at prices that, while still premium, are much more attainable. The R series is made up of several different speaker models. There are three floorstanding towers (R900, R700, R500), two center channels (R600c, R200c), two bookshelf speakers (R300, R100), one dipole (R800ds), and one sub (R400b) offering. 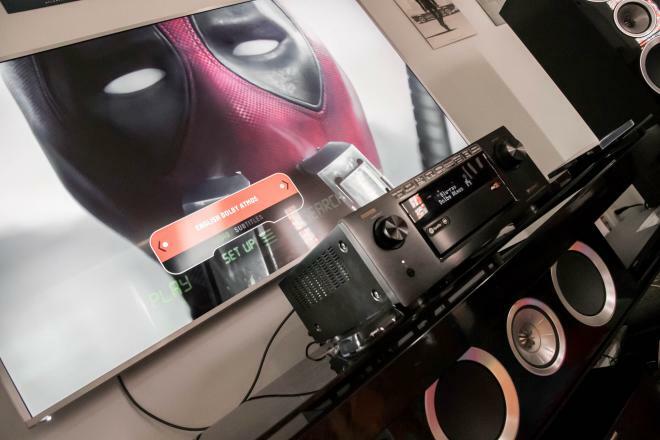 If you are interested in Dolby Atmos hemispherical surround sound (adding two-four height speakers to a conventional 5.1 or 7.1 setup), the R Series has two options: the Dolby Atmos enabled up-firing R50 add-on module (designed to sit atop an R Series tower or bookshelf speaker), OR you can purchase in-ceiling speakers like the Ci200RR THX. Color choices include piano black, walnut, rosewood, and piano white, though the R50s are available in black-only, the R400b subs come in black or white only, and KEF in-ceilings covers are generally white. Before we dive into my review experience (SPOILER ALERT: KEF's lawyers had to threaten me in writing because I didn't want to send them back), let's break down the R Series by cost and key specifications. At the top of this elegant, acoustical pyramid, we have the R900. At $2,499.99 each, this tower adds twin 8-inch LF drivers to the 5-inch Uni-Q HF/MF driver array for a frequency response of 35Hz to 45kHz with a maximum output of 115db at 8Ω. The R900 weighs 65lbs (29.5kg) and measures 44.5" H x 9.4" W X 14.4" D without the plinth. Adding the feet takes you to 46.5" H x 14.1" W x 15.3" D.
At $1,799.99 each, the R700 tower boasts twin 6.5-inch LF drivers in addition to the Uni-Q array for a 37Hz to 45kHz frequency range, a maximum output of 113dB at 8Ω. Smaller than the R900, the R700 weighs 57lbs (25.9kg) and measures 42.1" H x 8.3" W x 13.6" D without the plinth. Add on the adjustable legs and feat and you arrive at 44.1" H x 13.0" W x 14.5" D.
R500 towers MSRP for $1,299.99 each. In addition to the Uni-Q array, twin 5.25-inch LF drivers handle bass, good for 111dB maximum output at 8Ω with a frequency range of 39Hz to 45kHz. R500 floorstanders weigh a comparatively light 48lbs (21.8kg) and measure 40" H x 7.1" W x 12" D without legs or feet. With the plinth installed, R500s take up 42" H x 11.8" W x 12.9" D.
R300 bookshelf speakers, at $1,799.99/pair, boast the same 6.5-inch LF bass unit from the R700 towers, but because there is only one, frequency response is limited to 42Hz to 45kHz with a 110dB maximum output at 8Ω. These bookshelf speakers weigh 26.4lbs (12kg) each and measure 15.2" H x 8.3" W x 13.6" D, and include a nice set of rubber feat for sound isolation. R100 bookshelves stand out because, although they share the 5.25" driver dimensions of the R500 towers, the R100 is the only two-way bass reflex speaker in the series. In other words, the Uni-Q array is set in a 5.25-inch aluminum driver designed to handle both mid and low frequencies. To account for this, the R100 has the largest Z-flex surround given this speaker cone the most room for movement. Frequency response is still a competitive 49Hz to 45kHz with a 107dB maximum output at 8Ω. R100s weigh 14.5lbs (6.6kg) and measure 11" H x 7.1" W x 11.4" D. It too includes rubber sound isolation stick-on feet and costs $1,199.99/pair. On the center channel front, the R600c is the flagship model, costing $1,499.99 each, and features the same twin 6.5-inch LF woofers as the R700 towers. However, because it's a smaller cabinet, frequency response drops slightly, to 50Hz to 45kHz. Thankfully, it retains the 113dB maximum output at 8Ω. The R600c weighs 37.9lbs (17.2kg) and measures 7.9" H x 24.8" W x 13.2" D. This is one tall center channel. Stick-on sound isolation feet are included and sound great. 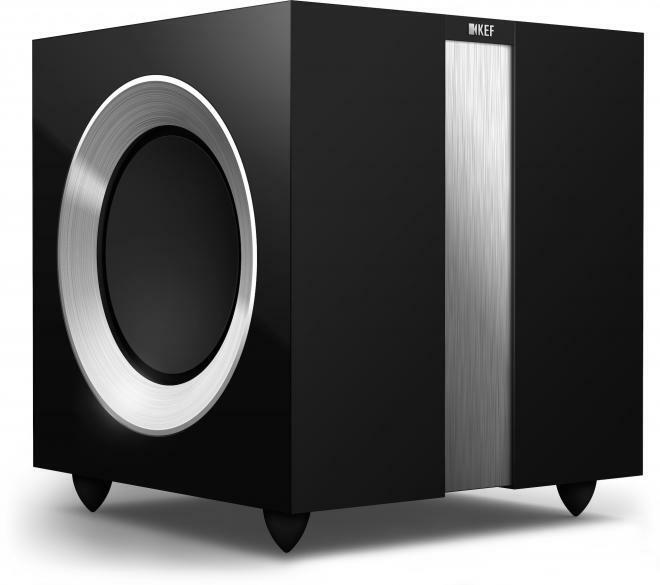 The other center channel option is the $999.99 R200c, which shares components with the R500 towers and R100 bookshelves. In the R200c's case, this means twin 5.25-inch bass units plus a 111db maximum output at 8Ω. Frequency response is 52Hz to 45kHz, it weights 31.7lbs (14.4kg) and measures 6.7" H x 20.9" W x 12" D.
For details on the $1,199.99/pair R50 Dolby Atmos-enabled speaker, please read our FULL REVIEW. 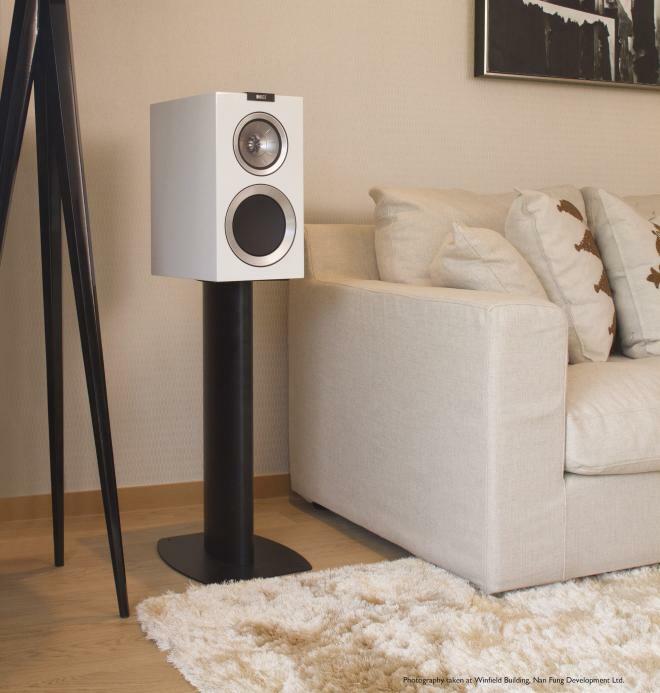 Some home cinema enthusiasts prefer the wider dispersion of dipole speakers for their surround speakers. If that's you, the R800ds dipole surround speaker is configured almost like a dual R100 bookshelf. It costs $1,799.99 for a pair and features two 5.25" Uni-Q driver arrays with a 107db maxmium output at 8Ω and a 90Hz to 45kHz frequency response. R800ds dipoles weigh 16.3lbs (7.4kg) each and measure 7.1" H x 13.8" W x 7.2" D.
Last, but certainly not least, we have the extraordinary $1,699.99 R400b powered subwoofer that weighs 47.4 lbs (21.5kg) while taking up a minimum 14" square. Tucked into this compact package are twin 250W class-D amplifiers and dual 9-inch LF drivers mounted back-to-back in a braced and sealed cabinet. This force-canceling subwoofer doesn't suffer from cabinet agitation and boasts a 26Hz to 140Hz frequency range with a 111dB maximum output. Connections include RCA phono sockets and speaker level inputs. Part pie in the sky, part excuse to demo all three towers, my loaner system arrived in piano black high gloss and mated all three pairs of the available floorstanding speakers (R900, R700, R500) with the larger R600c center channel, dual R400b subwoofers, and four Ci-200RR THX in-ceiling speakers. If you were to purchase that entire system, it would cost just over $16,000 for the 7.2 setup, or just over $19,000 for the full 7.2.4 experience. I placed the R900 towers up front, the R700 towers to the sides, and the R500 towers as rear-surrounds before doing A to B to C stereo music comparisons of each tower pair. I'm well aware spending twenty grand on thirteen speakers (not including amplification) is insane for most people. Luckily, given the breadth of the R Series offerings, you have a choice of configuring more to you budget, starting with a $5,100 MSRP 5.1 system that includes one R200c center channel, four R100 bookshelf speakers, and the sub. From there, you can mix in the larger center channel, add towers, OR swap in dipoles, more subs, and larger bookshelves and Dolby Atmos speakers. It's really up to you. In talking to the folks at KEF, one particular sweet spot for 5.1 or 7.1 is matching the R600c center with two R700 towers, one R400b sub, and two-to-four R300 bookshelves. For that $7,100 to $8,900, you get five to seven ear-level speakers with matching Uni-Q array and bass drivers for perfectly balanced performance. If I didn't have to fix a few cracks in my foundation, I'd be doing just that this very week. Setting up the KEF R Series is definitely a workout (the towers are quite heavy), but it's a simple process thanks to fantastic on-box instructions and the plug-and-play nature of these speakers. To set up the floorstanding speakers, you open the bottom of the box, attach the adjustable plinths (metal spikes), and move into position. 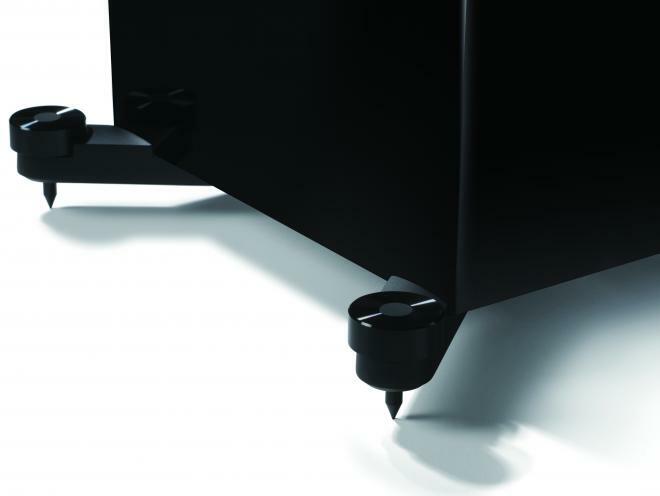 If you have hardwood floors, no worries, KEF includes feet where you can set the spikes. Bookshelf and other model speakers are easier to remove from the boxes and include rubber feet "stickers" for sound isolation. Then, with a little bit of toe-in on the fronts and rears, you're pretty much good to go. Many speakers need break-in to loosen up and sound their best; the R Series impresses right out of the box and only gets better over time. Wiring is also a breeze, with each speaker offering a bi-amp option. To use with banana plugs, simply pop out the plastic tab on the speaker terminals. The one area of concern, for anyone using automatic room calibration software, is that some calibrators like Audyssey will erroneously detect an out-of-phase error thanks to the way the Uni-Q work. The solution: a quick wiring check and click IGNORE. In any sense, I think AVRs from companies like Denon, Yamaha, Onkyo, and Pioneer do a pretty good job of calibrating a room, especially in balancing dual subwoofer setups, but I personally tend to override auto setting in favor of manual tweaking. If there's one complaint to the design, it's dust. I'm used to this, having owned black gear and media shelving for several years, but the KEF R Series requires constant dust vigilance for those with keen eyes (note to self: buy stock in Swiffer). Once powered and playing, stereo and surround sound imaging is so excellent it would be easy to forget the R Series is in the room with you... were it not for their ultra high end design of aluminum circles set into high gloss black services. 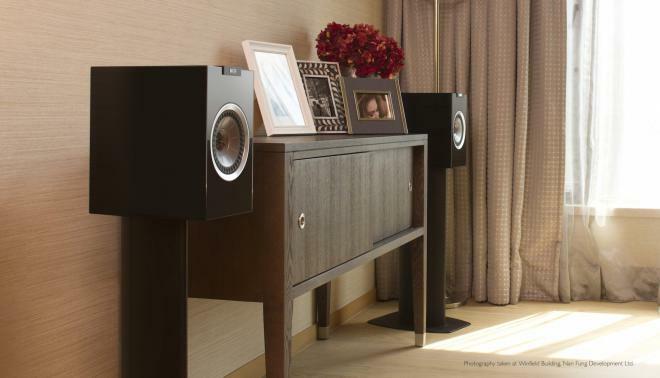 The speakers evoke a quiet elegance one can't help but admire. Now the hardest part of any speaker review. How do I, in words, describe the tonal qualities of a speaker system? I think it's all about detail and fidelity. What did you hear that you've never heard before? And are these new details positive, or negative? For me, I listen the nightmarish voices calling out to Mad Max in the opening of 'Fury Road', the guttural roars of the Kaiju in 'Pacific Rim', the accuracy of the bullets in 'John Wick', the chilling house moans of 'Crimson Peak', and the sheer scope of the climactic battle scenes in 'Game of Thrones: Season 5'. In all of these examples, and more, the R Series reveals every single layer of every single sound effect, evoking clarity and precision at any volume. These speakers are utterly transparent. In a 7.2 configuration, the triple tower system is the most complete channel-based surround experience I've ever heard. With the wrap-around panning in 'Mission Impossible: Rogue Nation' and 'Deadpool' or even streaming HBO series like 'Band of Brothers', the R Series simply envelope, a sensation that improved by moving my seating position slightly behind the side surrounds. Add in-ceiling or Dolby Atmos-enabled speakers for a 5.1.4 or 7.2.4 configuration? Forget about it. Outside of professional mixing stages and the handful of Dolby Cinema locations worldwide, there are very few movie theatres I would't challenge to a demo off with these speakers. Object-based surround sound is an incredibly immersive technology, and with mixes like 'Bram Stoker's Dracula', 'Sicario', 'Everest', 'The Fifth Element', and 'Sherlock: The Abominable Bride' available now, I dream of a day where everything is mixed this way. Of course, with Dolby Surround and DTS:Neural:X engaged, it's easy to pretend we're already there. Outside physical media, KEF Rs perform admirably with DirecTV and streaming services like Netflix, HBO GO, and FX Now. Netflix, in particular, has had wonky audio compression issues in the past, and maybe they've improved things a little, because everything from Disney animated features to their new original series don't sound digitized at all. HBO GO also offers 5.1 sound mixes; there I binged 'Vinyl' where the KEFs adored the '70s music as well as the show's crazy opening title sequence. FX Now only offers 2-channel sound, but there were no troubles. Lastly, watching everyday television like 'The Americans', 'Empire', and 'How To Get Away With Murder', all of it sounded like I was in a mixing stage. Even MLB baseball is terrific. The R Series reminded me that our ears are not doomed should we encounter lossy compression codecs, and proved that streaming has come so far that one service is now matching or outdoing Blu-ray and Ultra HD Blu-ray (with specific content). I'm not kidding. While most streaming can't compete, one VUDU UHD offers an extraordinary cinematic experience. I currently have a VIZIO P65-C1 P-Series Home Theater Display in for review, which is one of the first displays capable of accessing VUDU UHD. Titles like 'Pacific Rim', 'Live. Die. Repeat. ', 'Man of Steel', and 'Mad Max' offer BOTH Dolby Vision and Dolby Atmos (via Dolby Digital Plus), while titles like 'The Great Gatsby' and 'Point Break' combine 4K Dolby Vision with 5.1 DD+ sound mixes. Results vary by title, of course but 'Pacific Rim' and 'The Great Gatsby' are jaw-droopingly beautiful in DV, and both 'Live. Die. Repeat' and 'Pacific Rim' offer improved surround experiences bettering their Blu-ray counterparts... which is just crazy given the lossy / streaming source. 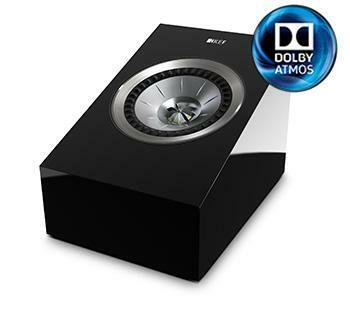 Overall, I was thrilled with the KEF R Series for watching movies and television, as they produce an experience akin to sitting on the mixing stages with the filmmakers. But what about music? The R Series is a special speaker line as a whole, but these towers are going to put a lot of smiles on a lot of audiophile faces, yet the R Series' inherent transparency seems much less forgiving to low quality MP3s or streaming services. The highlight, of course, is Blu-ray Audio with 'Roger Waters The Wall' being an a/v tour de force. After that streaming over Bluetooth, as well as from Spotify and Pandora, produced pleasing results most of the time. When you do lob in a low-bandwidth stream, you'll know it. As the old saying goes, junk in, junk out. There's ain't no way for the Rs to render what ain't there. I spent 95% of my review listening to either the R900s as a stereo pair, or a multi-channel configuration using Dolby Surround and DTS:Neural:X. The R900s are an audiophile's dream. Whatever music you like -- be it classical or rock or rap or country -- the KEF R Series reproduces exactly what you give it. Thumping bass lines and drum hits. Grungy guitars. Singing strings. The R900s provide a clear and accurate full-range speaker experience that feels complete. But it's also the most expensive option, which leads us back to the R700 and R500 tower options. The key to the R Series is uniformity of the Uni-Q driver array across most of the platform, so when you listen to all three floorstanding towers back to back (to back), mid and high tones are virtually interchangeable. R700 and R500 Floorstanders may cost less and are much more compact, yet produce the same vocals and guitar solos as their bigger brother. The difference, as the listed specifications imply, comes on the lower end. R900 towers are simply the most well-rounded. Comparatively, R700 towers are still better than speakers you'll hear at many price points. R500s lack just the faintest amount of oomph. I want to talk about in its own section. 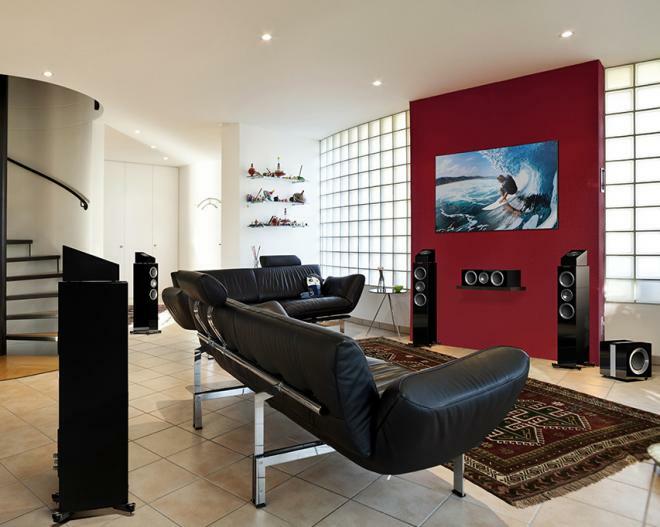 Make no mistake, the R400b is an expensive, but breathtaking sub, visually and sonically. Yes, there are more affordable options and some might even hit lower frequencies, but these stylish cubes offer an insane amount of performance in one of the most compact packages available. 500W internal power and absolutely NO internal vibrations? Are you kidding me??? For shits and gigs, I literally put one of these subs an inch away from the wall and, though I wouldn't recommend such placement, there was virtually no booming. Instead, even more so with a pair running, R400b subs produce clean, punching, resolute, heart-in-your-throat bass. You can feel them pressurizing the room and, yet, they're so small you can tuck them anywhere. In fact, I could only tell if they were too loud if my house started to rattle, which is more an old house issue than a subwoofer one. And most of you would be happy with a single sub configuration -- I mean, I wouldn't necessarily count on them to move as much air as, say, 15" Klipsches, but for small to medium sized spaces, one R400b is going to pressurize your room wonderfully. Two is even better, particularly at lower and louder volumes. I love the R towers, for sure, but the R400b is the star of the entire R Series lineup, and is one of the cleanest, easy-to-use subs available today. Wow. If you're looking for premium speakers to fill your home theatre and handle a variety of musical genres, you can't do much better than the KEF R Series. Transparent. Well-rounded. Superb rendering and imaging at all volume levels. A powerful-yet-compact subwoofer. Fantastic in pieces, but as a complete sysem your home will sound better than your local movie theatre. There's almost nothing to nitpick, though badly compressed audio might reveal itself, and prepare thyself to declare war on dust. Whether you're researching a money-no-object tower of power system or looking to step up to your first set of high-end speakers in the form of a smaller 5.1 system, there's an R Series configuration for many different budget levels starting at around five grand. If you can afford them, the KEF R Series comes Highly Recommended.